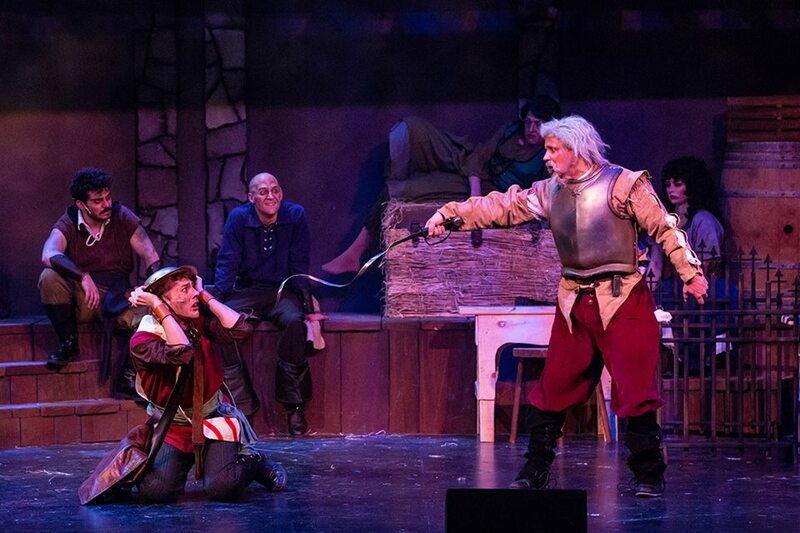 In today’s troubled world blistered with natural disasters, war torn countries and divisive politics, hope and optimism seem almost impossible to arouse, yet The Candlelight Dinner Theater does just that in their production of Man Of La Mancha. 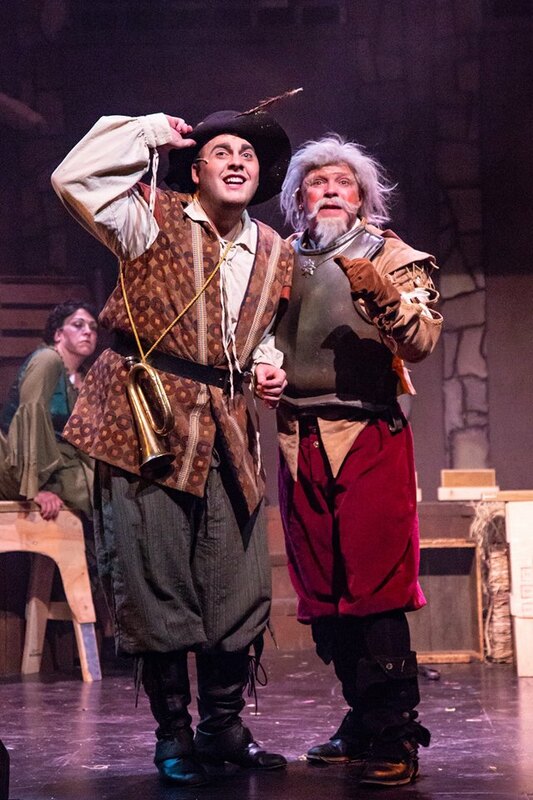 The musical inspired by Miguel de Cervantes’ masterpiece, Don Quixote was written in 1964 by Dale Wasserman with music by Mitch Leigh and lyrics by Joe Darion. The Broadway production in 1965 won five Tony awards including Best Musical making this show one of the most beloved and timeless musicals in American Broadway history. The character of Cervantes is thrown into a prison during the Spanish Inquisition accused of foreclosing on a monastery in the failed occupation of a tax collector. Accompanied by his manservant Sancho Panza, Cervantes manages to convince the prisoners to delay the theft of the trunk he has brought with him and the beating he was sure to endure at their hands with a trial by way of him telling the story of Don Quixote using the other prisoners as his cast mates. Thus, the foundation is set for Cervantes to pull a costume and box of makeup out of the trunk and assume the role of Don Quixote deftly transformed here by David L. Wygant. Wygant sings Man Of La Mancha with a smooth gorgeous tone that only boosts our anticipation of The Impossible Dream which he sings expertly at the end of the first act. Though his acting is true, Wygant somehow misses the grandeur of the role and is swallowed up by the large ensemble and gorgeous set created by Halea Coulter. Ethan Knowles as his manservant, Sancho Panza fares no better reducing Panza to such a simplistic dullard that he all but disappears amongst the strong male ensemble. The men filling out the cast however, are not only captivating but unified in song, beautifully breathing life into songs, Dulcinea and Little Bird. 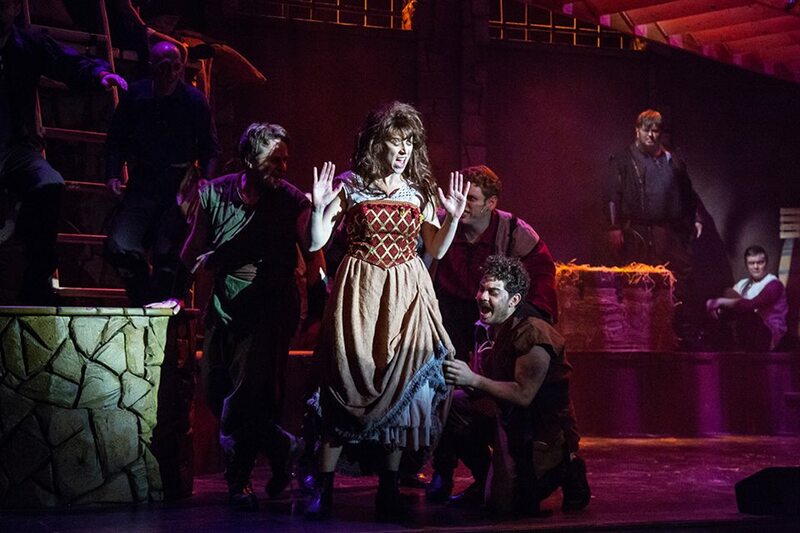 Aldonza the kitchen wench played by Heather McClain is the object of the men’s attention in both songs and immediately conveys a woman of strength forced to create a hard-outer shell for survival. McClain clearly understands the severe nature of Aldonza and plays her with great fire, unfortunately though her vocals become somewhat shrill and screeching in her upper range. As the prisoners take on the other characters in Cervantes’ play within a play, we are treated to strong performances by Thomas P. Castro as Duke, Kent Sugg as The Innkeeper, Eric Heine as Padre, George Lemmon as Pedro and Annie Dwyer as The Housekeeper. The ensemble is one of the best sounding in some time, bringing this production to its conclusion with a poignant reprisal of The Impossible Dream. Directed by Scott Beyette there seemed to be reverence for the show almost making it too precious and pretty to really convey the extreme nature of the inquisition thus the great significance of Quixote’s optimism. Bob Hoppe’s choreography shines in silhouette at the opening of the show and then again when Quixote comes upon a group of gypsies. The fight choreography is ambitious and well done, but stumbles in execution. The combat at the end of Act I is done with such tentativeness and hesitation that it almost seems to be in slow motion with every strike telegraphed poorly to the audience. 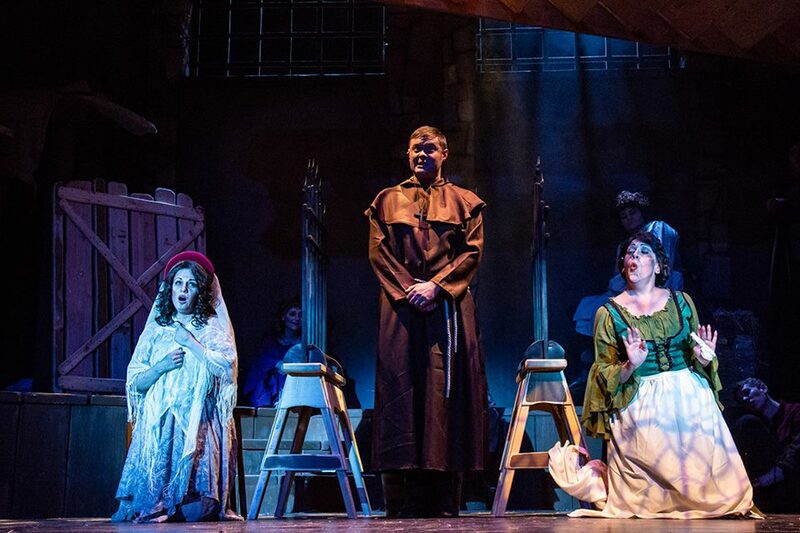 Even so, the production at The Candlelight Dinner Theater is visually stimulating with excellent costuming by Liz Hoover and a sumptuous lighting design by Vance McKenzie. It’s entertaining with magnificent songs and a much-needed tale of optimism and perseverance of the human spirit. Overall the performances were earnest and enthusiastic, performed by a talented and experienced cast that like Don Quixote, dared to dream the Impossible dream. Candlelight Dinner Playhouse is located at 4747 Marketplace Drive in Johnstown, CO (I‐25 at Exit 254). or call the Box Office at 970-744‐3747.